IN A SMALL BOWL, COMBINE THE GREEN CLAY AND GREEN TEA AND BLEND WELL. GREEN CLAY, ALSO KNOWN AS FRENCH GREEN CLAY, IS A TYPE OF MINERAL CLAY THAT CONTAINS HIGHLY ABSORBENT PROPERTIES, WHICH IS WHY IS IT IS GREAT FOR ELIMINATING OILY HAIR PROBLEMS. GREEN TEA IS AMAZING BECAUSE OF THE ANTIOXIDANTS IT CONTAINS WHICH ARE POWERFUL BECAUSE IT HAS BEEN FERMENTED. IT IS GREAT FOR CONTROLLING DANDRUFF AND PSORIASIS AND CONTAINS THE BENEFICIAL VITAMINS SUCH AS VITAMINS C, D, E AND B5. NEXT, ADD THE CASTILE SOAP. CASTILE SOAP IS GREAT BECAUSE IT’S PURE. YOU CAN USE A PLAIN VERSION OR CHOOSE PEPPERMINT, FOR EXAMPLE. I LIKE DR. BRONNER’S CASTILE SOAP. 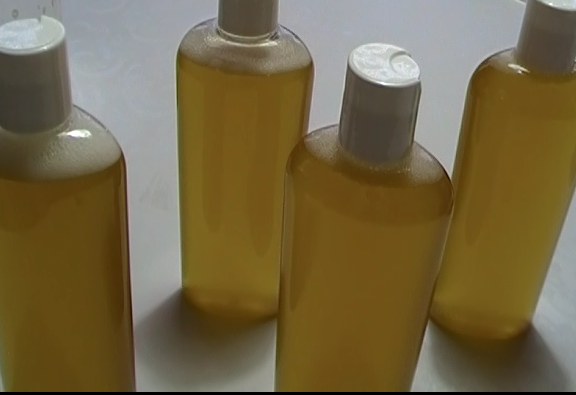 CASTILE SOAP IS GREAT BECAUSE IT’S PLANT-BASED, PURE, ALL-NATURAL AND CHEMICAL-FREE. THIS GIVES IT THE ABILITY TO PROVIDE HEALING QUALITIES. ONCE YOU HAVE ADDED THE CASTILE SOAP, MIX THOROUGHLY WITH THE CLAY AND GREEN TEA. NOW, LET’S ADD THE HONEY AND APPLE CIDER VINEGAR (ACV). HONEY IS A NATURAL HUMECTANT, HELPS MAKE THE HAIR SOFT AND SHINY AND FIGHTS OFF BACTERIA WHILE THE APPLE CIDER VINEGAR PROVIDES USEFUL PH BALANCING EFFECTS. MEANWHILE, THE ACIDS AND ENZYMES FOUND IN ACV CAN ALSO KILL OIL-MAKING BACTERIA. MAKE SURE TO BLEND ALL INGREDIENTS. ONCE BLENDED, ADD THE WATER AND MIX WELL. MAKE SURE TO USE PURE WATER TO AVOID ANY BACTERIA AND CHEMICALS. LASTLY, BUT DEFINITELY AN IMPORTANT INGREDIENT IS THE TEA TREE OIL. TEA TREE OIL IS AMAZING FOR MANY REASONS, BUT SPECIFICALLY IT HELPS TO UNCLOG SEBUM THAT MAY BLOCK THE HAIR FOLLICLES. TEA TREE ESSENTIAL OIL HELPS FIGHT BACTERIAL AND FUNGAL INFECTIONS THAT MAY OCCUR, AND IT CAN HELP REMOVE EXCESS OIL AND DIRT PARTICLES. BLEND THE TEA TREE OIL INTO YOUR MIXTURE. NOW THAT ALL INGREDIENTS HAVE BEEN BLENDED, IT’S BEST TO USE A FOOD-GRADE BPA-FREE PLASTIC BOTTLE OR A DARK GLASS JAR WITH A TIGHT FITTING LID TO KEEP LIGHT FROM AFFECTING IT BENEFICIAL PROPERTIES. TO APPLY, SIMPLY SHAMPOO AS NORMAL AND RINSE. TO STORE, I SUGGEST KEEPING IT IN THE FRIDGE SINCE WE ARE NOT USING ANY PRESERVATIVES AND BECAUSE WE ADD WATER. COMBINE THE GREEN CLAY AND GREEN TEA AND BLEND WELL. ADD THE CASTILE SOAP AND BLEND AGAIN. NOW, ADD THE HONEY AND APPLE CIDER VINEGAR AND CONTINUE BLENDING UNTIL WELL MIXED. THE MIXTURE WILL LIKELY BE A BIT THICK AT THIS POINT. ADD THE PURE WATER AND THE TEA TREE ESSENTIAL OIL. BLEND UNTIL ALL INGREDIENTS ARE MIXED AND SMOOTH. PLACE IN A BPA-FREE BOTTLE OR GLASS CONTAINER FOR STORAGE. STORE IN THE FRIDGE UP TO 3 WEEKS.